It is always a relief to be reminded that the spirit of democracy still lives, especially in such divisive times. 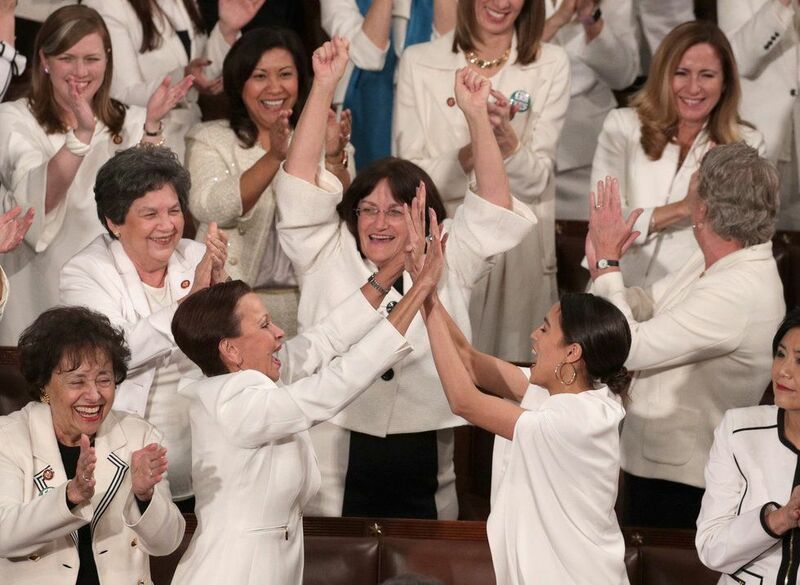 The women of the Democratic Party took that notion to heart last night during the State of the Union address, wearing "suffragette white" to President Trump's remarks. For greater context, white was a power color worn by the suffragettes in the early 20th century, and remains both an homage to those who fought for women's voting rights and a symbol of peaceful protest by many groups. Last week, the Democratic Women's Working Group encouraged women to wear white as a form of solidarity with women across the country. "Wearing suffragette white is a respectful message [...] and a declaration that we will not go back on our hard-earned rights," Representative Lois Frankel of Florida, the chair of the working group, told CNN, going on to note that there are more women in Congress now than ever in American history. Think of the powerful message such a sight sends to politicians, and for that matter, the nation across the divide. It's just as 2016 presidential candidate Hillary Clinton once said: that all of us, but especially women, are indeed "stronger together."